This nursing home negligence lawsuit was filed against ManorCare by a woman in Prince George's County after she suffers an ankle injury after being improperly lifted from a chair and placed in her bed. It was filed in Health Claims Arbitration on April 28, 2017 and it is the 202nd medical malpractice case filed in Maryland this year. A woman is a resident and receiving rehabilitation services at the facility of the defendants, Heartland and ManorCare. She is non-ambulatory and requires a lift when being moved from a chair to her bed. One day the lift is not functioning and two employees of the facility attempt to manually lift the woman from a chair to her bed. The woman's ankle becomes lodged in the railing of the bed and she suffers multiple ankle injuries requiring medical treatment and surgery. Certainly, you would think the standard of care when moving a patient is making certain you can move the patient without a limb getting lodged in the railing. Patient entrapment with bed side rails can occur in hospitals, nursing homes and at home. The FDA continues to receive reports of death and injury when patients become entangled or trapped between the mattress and bed rail or in the bed rail openings. The patients at greatest risk for entrapment are frail, elderly or confused. The problem in this case is that the Hoyer lift was broken so the nursing home employees decided to move the patient on their own. A Hoyer lift is an eponym like Kleenex, a brand name that becomes the name of a product class. In this case, a Hoyer lift describes a mechanical device often used in nursing homes to move patients. Four lift chains are hooked to the patent's seat. A vinyl or cloth pad is placed underneath the patient's body, then the Hoyer lift can either be manually with hydraulics or electrically pumped up. Typically one nursing home staff employee will crank the lift while the other holds and steadies the patient. After the patient clears the stretcher, the cranking staff member can assist with swinging the patient. Using a Hoyer with an amputee is different because these patients cannot counter balance themselves sufficiently when they are tilted forward. 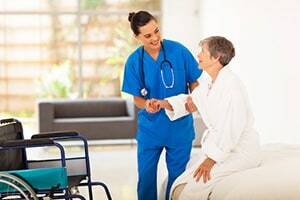 Good nursing homes have protocols that the health care provider always has their hands on or available to the patient in the lift seat as they tend to lean forward as they are lifted. Hoyer lifts are often the subject of nursing home slip and fall cases. Why? Nursing homes do not put them away. They should not be in the hallways if they're not being used. Instead, many nursing homes leave these lifts and other random junk in the hallways and other common areas where people are likely to trip and fall.